Amanda Jackson Band: Exciting News!!! Be a part of our history! Exciting News!!! Be a part of our history! People have been telling us they wish they could somehow take our show home with them so they can hear it all again and we've listened to them! 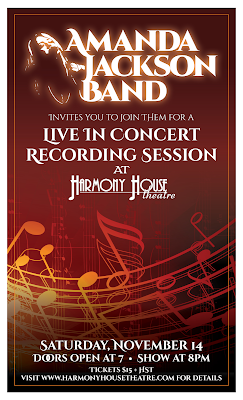 We are so excited to announce that with the help of Jon Matthews (The Sound Mill Recording Studio), Harmony House Theatre and all of our amazing fans, friends and family, we plan to capture our live show as a recording this coming Saturday, November 14th! We would love for you to be a part of this history and hope you'll come out to sing, whoop, holler and clap along with us when we press record! We will be giving everyone who attends the show a digital sampling of the evening (as soon as possible following the show) as a token of our gratitude for being there with us! Click here for all the details!